Sean Michael Chavez often finds himself with a foot in two worlds. From his work as a fine art painter and as a graphic designer, he’s finding an appreciative audience everywhere he steps. At the Oldest House Indian Shop, Chavez’s Oldest House poster is a new favorite. The vintage-style image reflecting the traditional travel posters of the 1930s and ’40s was created by Chavez through his position as a graphic artist at Studio Hill Design in Albuquerque. To produce the subtle shadow detail in the poster, Chavez created a 3D computer model to see day-by-day and hour-by-hour how the shadows in the scene change throughout the year. The poster image captures the sun at a low point in the south, around January or February, Chavez said. Chavez has spent 20 years of his career in graphic design with Studio Hill Design, a downtown Albuquerque firm creating authentic brand experiences, including logo design, website design, signage and vehicle graphics, print materials, advertising and interior branding. He came to graphic design from his interest in fine art. He realized it was a realistic way to pursue art and immediately pay the bills, but fine art continued to call to him. About four years ago, he decided it was time to get back to his roots and he began to seriously pursue oil painting. His images of the Southwest’s landscapes and people have been described a cross between Ed Mell’s angular deserts and skies and Logan Maxwell Hagege’s modern take on the Southwest. Acosta-Strong Fine Art in Santa Fe will debut Chavez in an opening titled “REVELATION” on April 18 – 29, 2019. 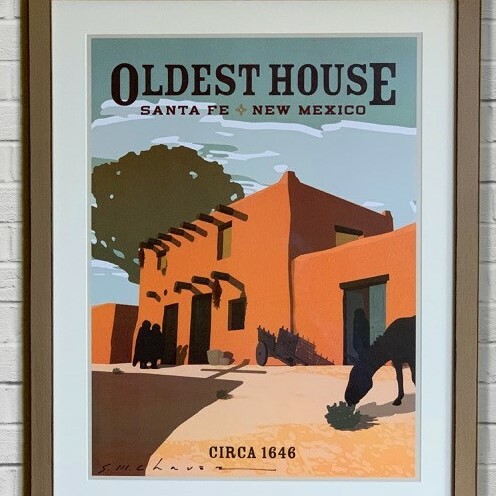 The general opening reception will be held April 19 from 5 p.m. to 7 p.m.
See history first hand at the Oldest House at 215 East De Vargas St. in Santa Fe. Or visit the Oldest House Indian Shop on line at www.oldesthouseindianshop.com. Reach the shop by phone at 505-988-2488. 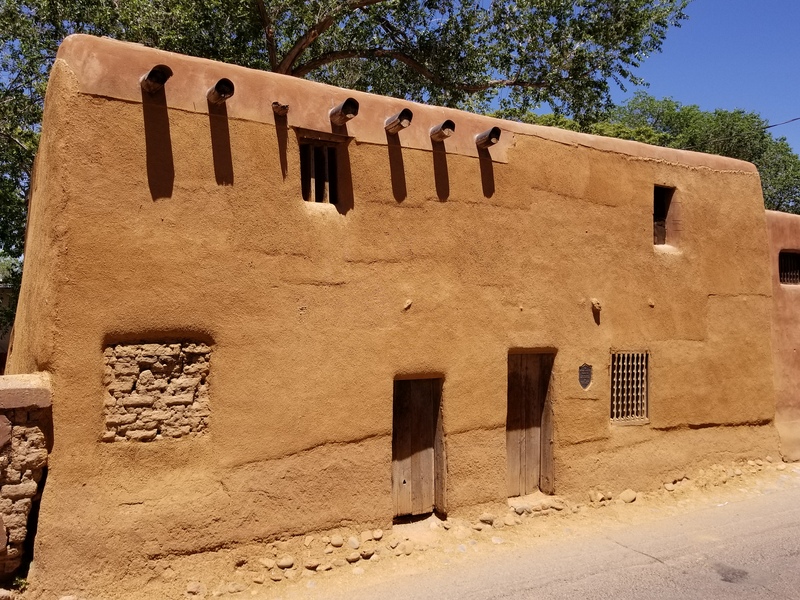 The city of Santa Fe was founded around 1610 by Spanish colonists, but its history as community of prehistoric peoples is thought to be have begun as far back as 1050 to 1150. Excavations by the New Mexico Office of Archeological Studies in the area of the Santa Fe Community Convention Center have revealed evidence of an early village that appears to have been occupied from the late 1200s until the first half of the 1400s. Prehistoric pit structures that may have been homes or ceremonial chambers are evident there. When the Spanish arrived around 1610, they were accompanied by Tlaxcalans, a group of people native to an area east of Mexico City who helped the Spanish bring down the Aztec state, according to historian Marc Simmons. The Oldest House is part of that barrio. Analco means “on the other side of the water,” in the Tlaxcalan’s Nahuatl language. 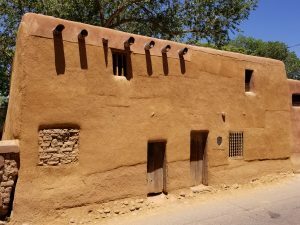 The name was fitting as the Indian suburb sat across the Rio de Santa Fe from the Spanish settlement with its plaza and Palace of the Governors. The Franciscan friars who joined in the settlement activities of Spain built an adobe mission in the neighborhood for the Tlaxcalans, the site of San Miguel Chapel that sits across from the Oldest House. The Barrio de Analco was the first section of Santa Fe to be attacked and razed during the Pueblo Revolt of 1680. Nervous colonists taking refuge in the Plaza watched as pueblo war parties approached from the cultivated fields to the south and gutted buildings in the barrio. Eventually, “a company of armed colonists and soldiers carried battle to the Indian warriors in the Barrio de Analco and its adjacent fields,” wrote Richard Flint and Shirley Cushing Flint in an article for the New Mexico Office of the State Historian. Simmons wrote that only a few Tlaxcalans returned to Barrio de Analco to reclaim their homes during the Spanish reconquest of Santa Fe in 1692. Those that did helped place new roof over the walls of San Miguel that survived its burning in the revolt. Some remnant of the Oldest House with its thick adobe walls and corner fireplace, dirt floors and low ceiling also likely gave them a place to restart their lives. 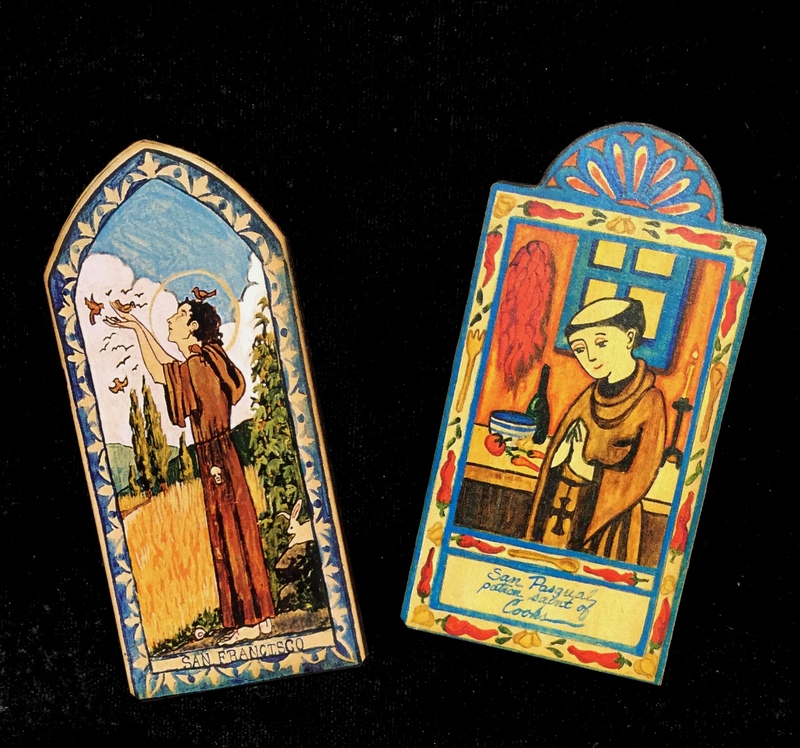 Lynn Garlick says the sweet, simple and sincere retablos she creates raised her son. As a single mom of a 3-year old with no extra money for Christmas presents, Garlick took her training in landscape and portrait painting and began to create Christmas ornament-sized paintings of Christmas saints. She sold the hand-painted ornaments at a local Christmas craft fair. From those craft fairs 27 years ago, grew Lynn Garlick Retablos. After her initial success, Garlick decided there must be a more efficient way to produce her images. A friend showed her an Italian altar screen made in medieval Europe in which an image was decoupaged onto board. She adopted the age-old technique, creating a high-quality print from her original design and decoupaging it onto pine and birch boards, creating affordable retablo pieces in a wide variety of sizes from plaque- to pocket-sized. As she researched the art of iconography and retablos, she saw a responsibility to create her art with honest prayer and energy. “I felt a responsibility to make the painting a prayer for healing, kindness and right thought,” she says. She also saw how deeply many people responded to the images of the saints and heard their stories of how saints had blessed their lives. “I hear so many stories from people: it’s very touching,” she says. She laughs recalling her son at 16 losing his car keys. “I told him to ask for San Antonio’s help,” she says. He headed off, annoyed and unconvinced that the saint invoked for help finding lost objects might assist. Then he returned, shaken. “Mom, that’s really creepy,” he said. “I told San Antonio, ‘I don’t believe in you. '” Then he stepped back onto a magazine laying on his floor and felt his keys under the magazine and under foot. “They tell me what they want to be, they don’t belong to me,” she says. Garlick started making her pocket-sized saints when her son turned 18. “I told him we could go anywhere in the world and he chose Japan,” she says. “That’s a long flight so I made a saint pack to carry to keep the plane in the air. That was the start of my pocket saints.” Now there are pocket saints, angels and blessings across the country and they have become her most popular offering. You can find Lynn Garlick Retablos at Oldest House Indian Shop located at 215 E. De Vargas Street in Santa Fe or online at www.oldesthouseindianshop.com. Used in health, healing and spirituality, the Native American Medicine Wheel is a symbol embraced by numerous tribes for generations. The Wheel can take many forms including artwork like an artifact or painting or a physical construction built to cover space on land. Jamie K. Oxendine of the Lumbee Tribe of North Carolina, editor of PowWows.com and director of the Black Swamp InterTribal Foundation, writes on PowWows.com that the symbolism and the name of the Medicine Wheel vary greatly among Native people, but its physical characteristics share a common structure. Added to the circle are two intersecting lines that create a cross in the center, separating the circle into four equal sectors. But there’s more to imagine. Added to the sectors are the symbols of color, which can also vary widely. The most common colors of the Medicine Wheel are red, yellow, black and white. Blue, purple and green are used by some tribes instead of black, Oxendine says. The four points on the circle and the four sectors can represent many different things and ideas, including the four directions, four seasons, four stages of life, four times of day, four elements of life and more. Native Voices: Native Peoples’ Concepts of Health and Illness, an exhibition by the U.S. National Library of Medicine and the National Institutes of Health, demonstrates how Native peoples today enhance their wellness through both traditional and Western healing practices. “Ceremony is an essential part of traditional Native healing,” according to the Native Voices exhibition. “Because physical and spiritual health are intimately connected, body and spirit must heal together. Traditional healing ceremonies promote wellness by reflecting Native conceptions of Spirit, Creator, and the Universe. They can include prayer, chants, drumming, songs, stories, and the use of a variety of sacred objects. 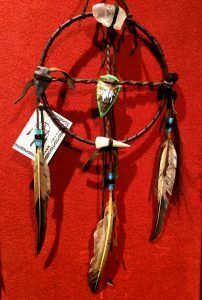 Discover more about this fascinating Native symbol at the Oldest House Indian Shop at 215 East De Vargas St. or online at www.oldesthouseindianshop.com. Reach the shop by phone at 505-988-2488. ALBUQUERQUE, NEW MEXICO-APRIL 24: The Gathering of Nations is the largest Indian Pow Wow in North America and it was held at the University of New Mexico on April 24, 2010 in Albuquerque . 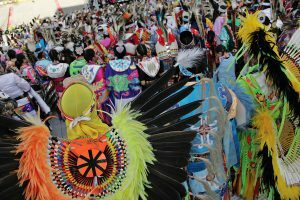 Nearly 3,000 American Indian dancers and singers representing more than 700 tribes of Canada and the United States will come together to celebrate and share culture at the Gathering of Nations Powwow and Miss Indian World Pageant April 26-28 at Tingley Coliseum/Expo New Mexico in Albuquerque. The event celebrates 35 years in 2018, with allevents open to the public and photos encouraged. The event begins with the Miss Indian World Pageant, the world’s largest cultural pageant for young native and indigenous women. On April 26 at 7 p.m., the Miss Indian World Traditional Talent Presentations take place at the Albuquerque Convention Center-Kiva Auditorium. The young women compete in public speaking at 1:30 p.m. on April 27 and 28 at Stage 49 on the Powwow Grounds of Expo New Mexico. The title of Miss Indian World will be awarded on April 28 at 7:30 p.m. inside Tingley Coliseum. The Powwow schedule begins at 10 a.m. on April 27 and 28 with pre-powwow performances inside Tingley Coliseum and the food court and Traders’ Market open all day. Events throughout the day include dancers’ grand entries, contemporary stage performances, competition singing and dancing, and horse and rider regalia parades. See the complete Gathering of Nations Powwow schedule at www.gatheringofnations.com. Visit the Oldest House Indian shop at 215 E. De Vargas St. in Santa Fe or online at www.oldesthouseindianshop.com. PHOENIX, ARIZONA – JUNE 5: The Heard Museum on June 5, 2013, in Phoenix, Arizona. 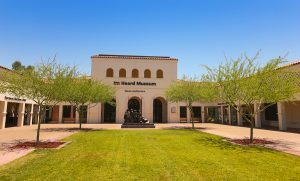 The Heard Museum is an internationally known museum of Native American cultural artifacts located on Central Avenue, Phoenix. Fully dedicated to American Indian art and artifacts, the Heard Museum in Phoenix presents the history, life, arts and culture of American Indian people from a first-person perspective. Visitors gain a deep understanding of the the art collections and of Native history through the museum’s work to share the stories of the artists and tribal communities it features. “Video and gallery interactive programs are all part of ways that we bring Native voices to our visitors,” Ann Marshall, Ph.D., director of curation and education at Heard Museum, told the National Endowment for the Arts in a 2016 interview. “Every year, our festivals bring hundreds of artists to the museum. Whether it is our Mercado de las Artes in the fall, the World Champion Hoop Dance Competition in February, the Indian Fair and Market in March, free First Fridays, or Free Summer Sundays, visitors have great chances to talk with artists and learn first-hand about their art.” The museum’s events draw more than 40,000 visitors annually. Recognized internationally for the quality of its traditional and contemporary art collections and known for its unrivaled collection of Hopi Katsinas (also known as Kachinas), the Heard has grown since its creation by Dwight and Maie Heard in 1929 to feature world-class exhibitions, educational programs and vibrant festivals. Growing from the couple’s exemplary personal collection of primarily American Indian artifacts and art, the museum’s collection spans more than 1,700 years of Native heritage —from 300 A.D. to the present – and features more than 40,000 objects including multiple generations of fine art, weavings, pottery, basketry, sculpture, Katsina dolls, and more, Marshall said. The museum’s exhibits include the moving Boarding School Experience gallery, which draws on the first-person recollections, memorabilia, writings and art of four generations of Indian school alumni and examines the controversial federal policy of removing American Indian children from their families and sending them to remote boarding schools in order to “civilize” them into mainstream society. Also featured among the Heard’s exhibits is an accurate recreation of the art studio of Santa Clara Pueblo painter Pablita Velarde/Tse Tsan “Golden Dawn”(1918-2006). Velarde, a pioneer as a woman painter during an era and community where painting was a male art form, depicted the traditional lifeways of her community that she feared would be lost, according to the Heard Museum’s website. The Heard Museum also is home to the Billie Jane Baguley Library and Archives. The comprehensive research facility holds resources on nearly 25,000 American Indian artists and offers extensive information about indigenous art and cultures from around the world. Oldest House Indian Shop owner Rick Smith has visited and used the library’s resources and finds them outstanding. 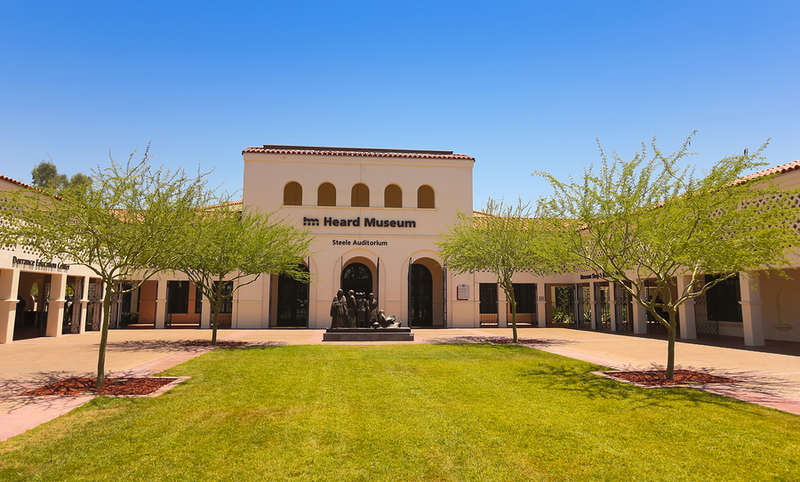 The Heard Museum is located at 2301 North Central Ave., Phoenix, Ariz. It is open Monday through Saturday from 9:30 a.m. to 5 p.m. and Sunday from 11 a.m. to 5 p.m. Admission is $18 for adults, $13.50 for seniors, and $7.50 for students with a college I.D. and children age 6 -17. For children 5 and under and American Indians, admission is free. Free general admission from 6 p.m. to 10 p.m. every First Friday except March. For more information, visit www.heard.org. 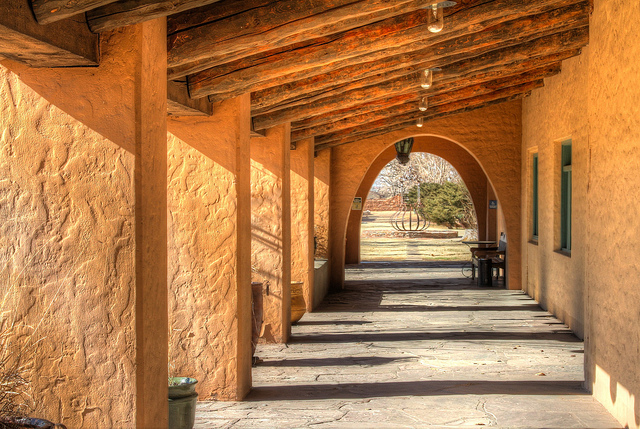 La Posada in Winslow, Ariz., by Steve McClanahan. Some rights reserved. 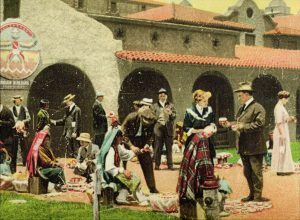 The story of Fred Harvey and the hotels, restaurants and tourism system he conceptualized and built along the Santa Fe Railway line throughout the Southwest is a story of inspired entrepreneurism. His legacy continues to inspire today as entrepreneurs pick up where he left off, most recently at Harvey’s La Castañeda Hotel in Las Vegas, N.M. In 2014, Allan Affedlt and his wife, Tina Mion, bought the shuttered 25,000-square-foot hotel built by the Santa Fe Railway in 1898 and in 2017 completed the financing to begin its restoration. They look forward to reopening the horseshoe-shaped hotel with its welcoming belvedere tower just off the railroad tracks in late 2019, according to the Santa Fe New Mexican. The historic property will join Affedlt and Mion’s La Posada, a Harvey Hotel designed by Mary Colter in Winslow, Ariz. The hotel, which opened in 1930 but had been used as railroad offices since the 1960s, was under threat of demolition by the Santa Fe Railway when Affedlt and Mion purchased it in 1997 and restored it with Daniel Lutzick. Conde Nast Traveler recently named the hotel to its Readers’ Choice Awards 2017 list of Top Hotels in the Southwest and West. “Although none of the partners is a hotelier by training, they have accomplished what once seemed impossible — transforming a forgotten but magical place in to a living museum,” La Posada’s website states. La Posada indeed is a magical place, also inspiring Oldest House Indian Shop owner Rick Smith after his first step into its lobby. “The epiphany came when my curiosity lead me to the timeless and well-maintained courtyard that was hidden from view…a time-traveler moment,” Smith says. Ever since, the idea of travelers headed west to “Indian Country” has fascinated Smith and inspired his career as a merchant set on creating fulfilling experiences for travelers and shoppers. Explore the Oldest House Indian Shop at 215 E. De Vargas St. in Santa Fe today! Fred Harvey first exposed train-traveling tourists to Native American silverwork and created a ready market in the early 1900s, but skilled artists behind the craft and the merchants who love them did and still do carry forward the beautiful tradition over generations, advancing and expanding the art form. The Oldest House Indian Shop features many jewelry artists renowned and awarded for their silver work and sought by galleries and collectors. 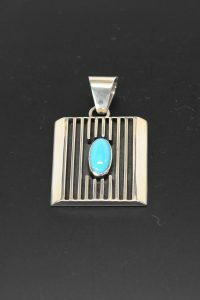 Francis Jones is a fifth generation Navajo silversmith who uses the traditional method of sandcasting to create her signature “tracks” pieces. Sandcasting is a intensive process that involves creating a mold out of a clay-like sand and pouring molten silver into it. The process destroys the mold so each piece is truly one-of-a-kind. Francis learned the art at age 14 from her father and over her lifetime developed her “tracks” collection, where black oxidized channels in the pieces contrast to emphasize the bold lines of silver that she calls tracks. 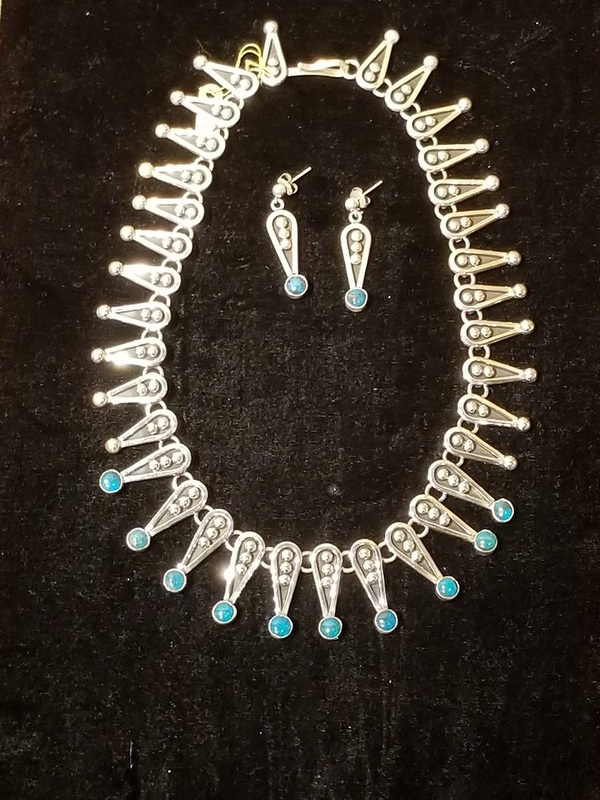 The award-winning artist has passed the traditional craft on to several of her children, who are are now accomplished silversmiths themselves. Johnathan Nez combines traditional Navajo stampwork with horizontal and vertical lines of black oxidized silver, creating a contemporary look that doesn’t lose sight of tradition. Specializing in bracelets, some of his work features polished handmade silver balls gracefully placed on a backdrop of oxidized silver and deep-set stamping into heavy-gauge sterling silver. Johnathan hails from a family of Navajo silversmiths and was mentored by his brother, renowned artist Leonard Nez. Murphy Platero learned the art of silversmithing from his mother, Lena Platero, renowned for her delicate feather jewelry. Murphy brings flowing motion to silver and turquoise with his unique pieces marked by overlapping strands and bundles of silver. 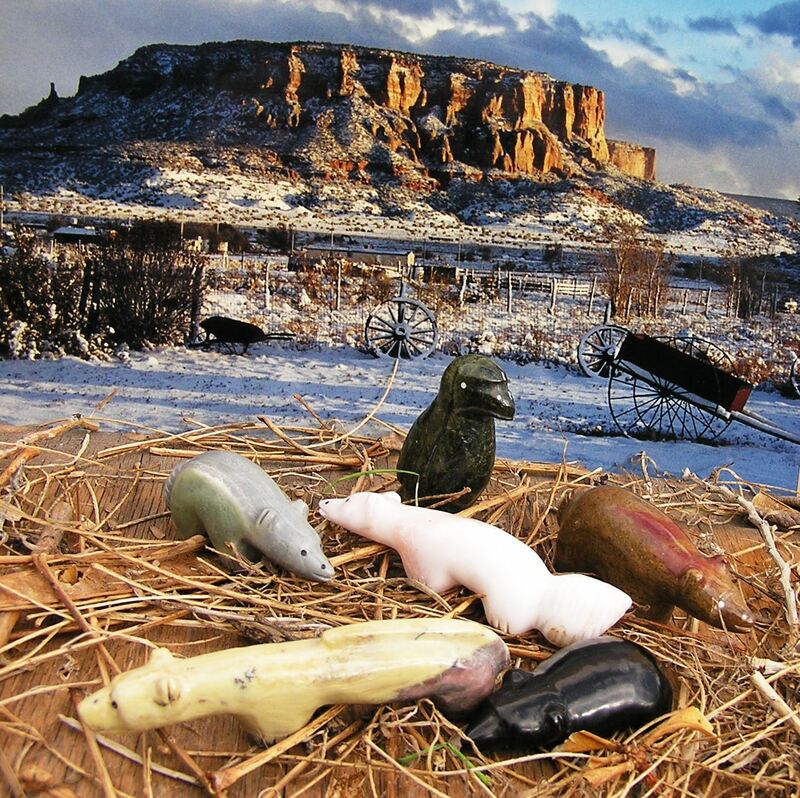 The Navajo artist’s contemporary work brings the Southwest style forward with a nod to the art of the past. 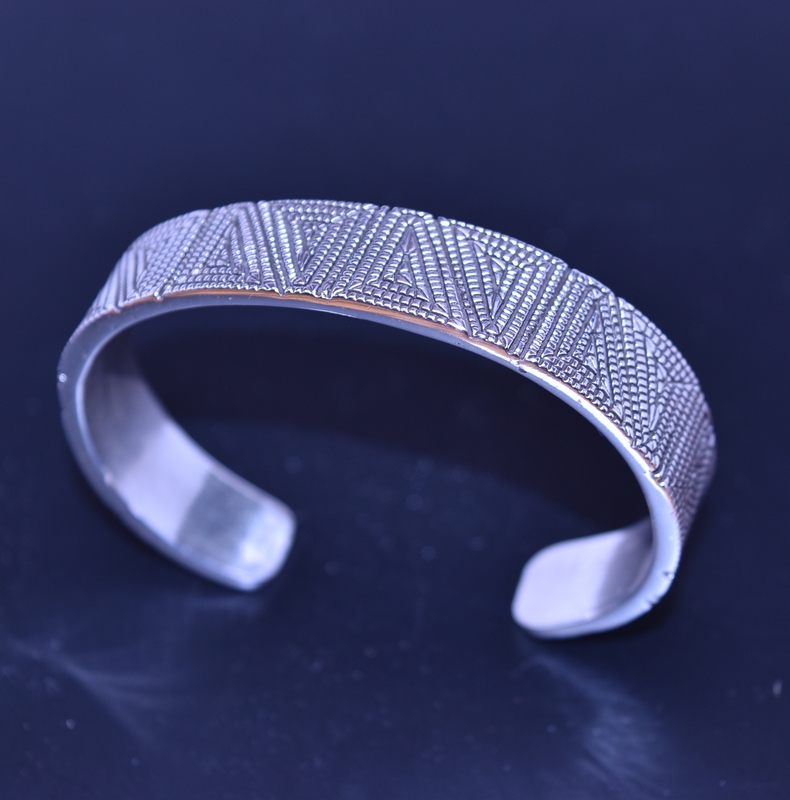 Elgin Tom hand-makes his own intricate stamps to create his jewelry, including his signature maze design, a pattern of coils of rounded squares bringing to mind rows of kernels on an ear of corn. The contemporary design was inspired by the Northern Native American art of painting on totem poles. 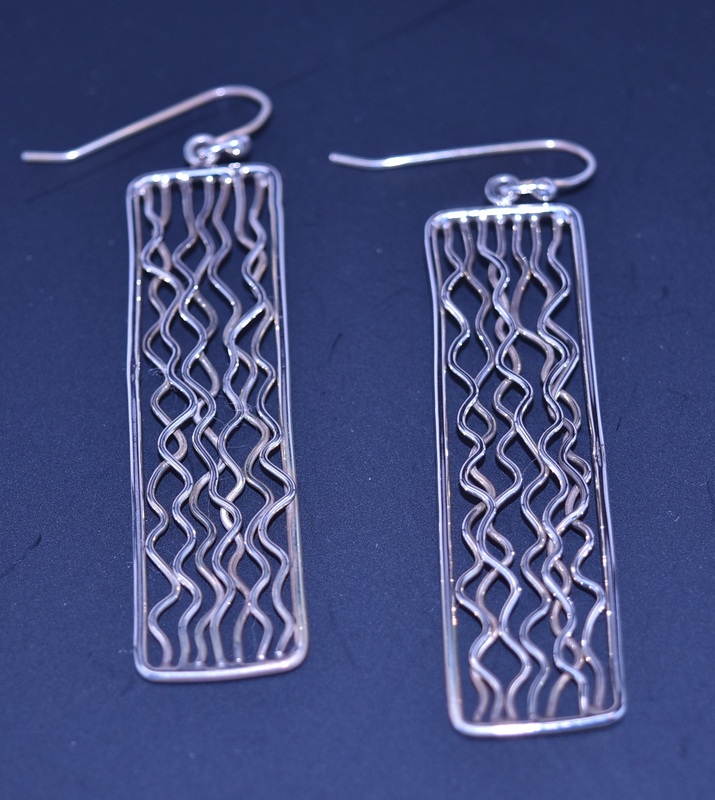 The intricate coils in the Maze pattern represent the symbols of family or clan. 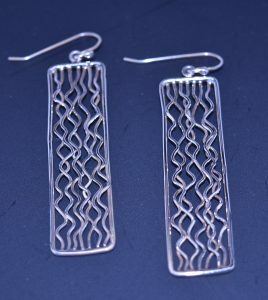 The Navajo jewelry artist learned his craft from his father and grandfather and incorporates his Maze design across a collection of hand-cast earrings, rings, pendants and bracelets. Visit the Oldest House Indian Shop and Smith’s life’s work at 215 E. De Vargas St. in Santa Fe to learn more and see the work of these talented people. Although he entered New Mexico 135 years ago, Fred Harvey’s influence remains, as the demand his company created for Native American art and Southwest tourism continue to thrive. The first cultural tourists of the Victorian Era and the early 1900s embraced the Fred Harvey Company’s innovations in travel, dining, merchandising and tourism and, of course, the Harvey House. 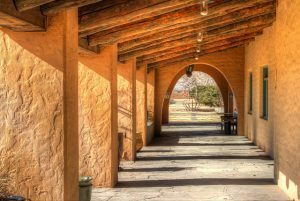 New Mexico’s 13 different Harvey accommodations offered comfort and civilization while traveling by train, as well as cultural expeditions and experiences unique to the Southwest. One such experience was the Indian Building at the company’s Alvarado Hotel in Albuquerque built in 1902. According to the website newmexicohistory.org, the Indian Building, a museum and sales room, was devised to “expose and educate the traveler to the uniqueness of handmade Indian crafts,” as well as to sell the merchandise. Herman Schweizer, who managed the Indian Building and traveled Indian Country to acquire the an extensive collection of Native American arts and crafts, enlisted the help of Native American artists as demonstrators of their work and salespeople at Harvey Houses throughout the Southwest. Schweizer helped drive the direction of Native American jewelry and crafts as an industry, including silversmithing. 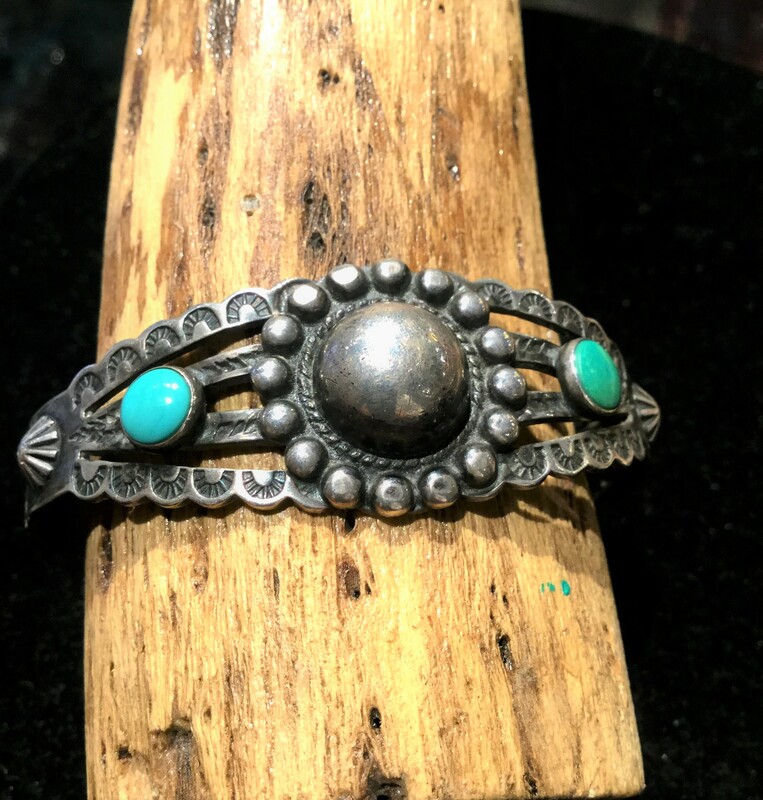 Mexican metalsmiths brought their craft to the Navajo in the early-1800s, and by the 1890s Navajo, Hopi and Zuni artists had developed their own styles of silverwork. At that time virtually all Native American silverwork was made for Native Americans, says Rick Smith of the Oldest House Indian Shop. That changed when the Fred Harvey Company entered the picture. 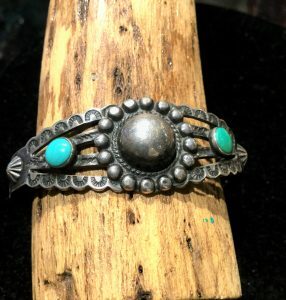 In 1899, the company began supplying turquoise stones and silver to trading posts in New Mexico and specifying the type and weight of jewelry needed for the tourist trade.The company purchased the crafts from the artists and sold these bracelets, rings and beads often called “Harvey House jewelry” or “workshop jewelry” on the trains over the Santa Fe line, at Harvey Houses, and at the Indian Building. Silver jewelry made in the last years of the 1800s and the first years of the 1900s is characterized by heavy stamp work and frequently featured arrows and symbols introduced or required by traders as “typically Indian” designs, most likely due to the influence of Schweizer and the tourist trade. 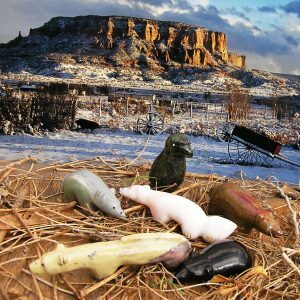 In a nod to Fred Harvey’s legacy and the original Native American craftspeople, the Oldest House Indian Shop offers the Indian Shop Legacy Collection. 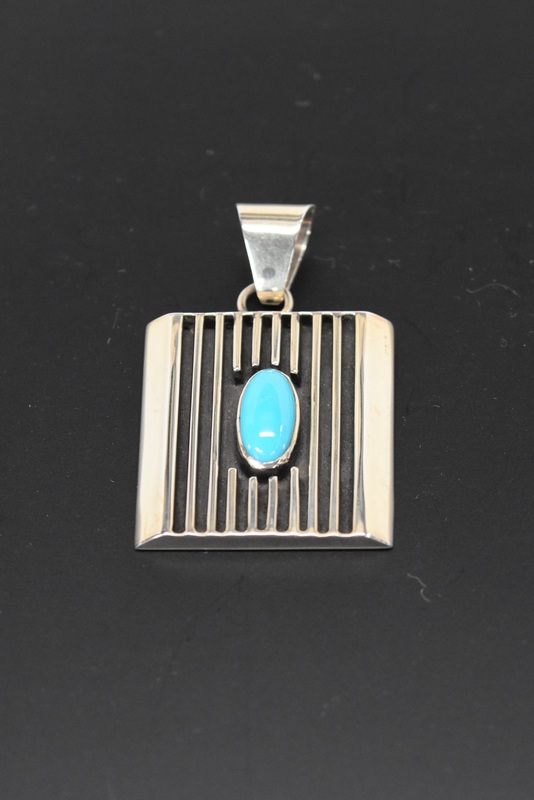 Inspired by the Harvey House jewelry created for sale during that nostalgic golden era of train travel to the exotic Southwest, many of the stamps used have been hand made in order to replicate the jewelry of that time. Visit the Oldest House Indian Shop at 215 E. De Vargas St. in Santa Fe to learn more and see the Legacy Collection.